PETER L. BERNSTEIN, one of the foremost financial writers of his generation, is the author of the bestselling, Against the Gods: The Remarkable Story of Risk and The Power of Gold: The History of an Obsession, both from Wiley, as well as five other books. He is President of Peter L. Bernstein, Inc., an investment consulting firm he founded in 1973 after many years of managing billions of dollars in individual and institutional portfolios. He is the founding Editor of the Journal of Investment Management. He has lectured widely throughout the United States and abroad, and has received the highest honors from his peers in the investment profession. Introduction: The Revolution in the Wealth of Nations. Chapter 1. Are Stock Prices Predictable? PART II: THE WHOLE AND THE PARTS. Chapter 2. Fourteen Pages to Fame. Chapter 3. The Interior Decorator Fallacy. Chapter 4. The Most Important Single Influence. PART III: THE DEMON OF CHANCE. Chapter 5. Illusions, Molecules, and Trends. Chapter 6. Anticipating Prices Properly. Chapter 7. The Search for High P.Q. PAR IV: WHAT ARE STOCKS WORTH? Chapter 8. The Best at the Price. Chapter 9. The Bombshell Assertions. Chapter 11. The Universal Financial Device. PART V: FROM GOWN TO TOWN. Chapter 13. The Accountant for Risk. Chapter 14. The Ultimate Invention. Chapter 15. The View form the Top of the Tower. Successful first edition. The first edition sold about 40,000 copies in softcover. It was published by Simon and Schuster, under the Free Press imprint. Author reputation. Peter Bernstein is a giant in the investment industry. Without question, he is the preeminent historian of modern investment and finance. He is the most widely-known, most respected, and best-selling author in professional investment and finance. Broad audience. Bernstein’s books are popular with professionals in investment, finance, and economics – that’s the foundation of his audience. But clearly Bernstein’s appeal transcends the boundaries the financial world. 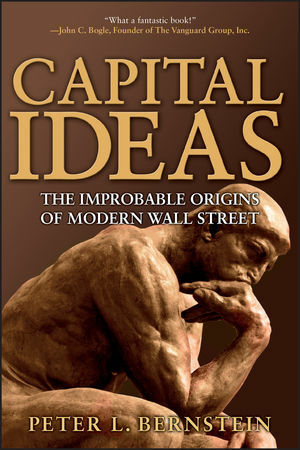 Fundamentally, his books are about the history of ideas and how the ideas are manifested in the real world – and, as such, he appeals to intellectually active readers who may have only a casual interest in finance and investment.